Free: Boxed Manuals → Cases for Prototyping On the Go? I’ve been saving these relics of the Information Age forever, initially because I had the computers to go with them, then out of nostalgia, then because I forgot I had them, and now because it seems like the boxes should be useful. But really, I’d just like them to go away. Anybody want some three-ring binders with matching boxes, maybe to put an Arduino and breadboard in to take with you on vacation and play with circuits when you’re stuck in Saint-Tropez for a couple of weeks with nothing to do? The rings oughtta be good for holding baggies of parts, or something. Seriously, if anyone wants any of these, they’re yours for the cost of shipping. The MS-DOS Operating System is missing one of the two volumes from the double-wide case; the Wordstar and Operating Instructions are intact in single-wides. This entry was posted on Wednesday, June 25th, 2008 at 07:37 pm	by Keith Neufeld	and is filed under Arduino, Hacks, Miscellaneous, Salvage. You can follow any responses to this entry through the RSS 2.0 feed. You can leave a response, or trackback from your own site. Oh, lordy, there’s a memory from the way-back machine. I actually have one of those tan and burgundy DOS manual boxes. 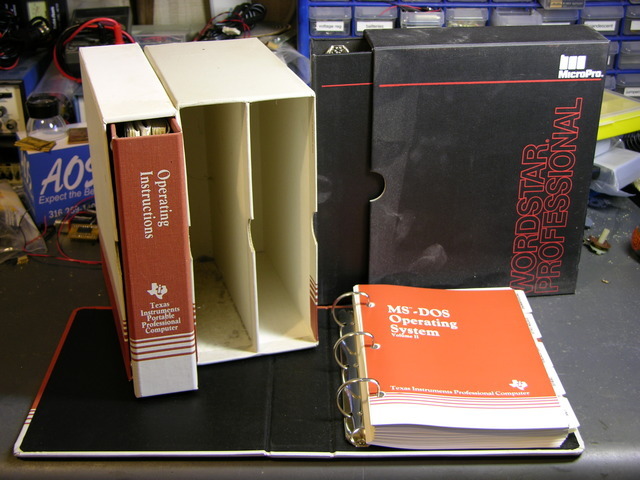 I’d pitched the DOS manual (user, not tech-ref) and put my own pages there, first to keep the PC info in. Why? I actually had an October 1981 dated IBM PC I’d bought from a friend in one of my MBA classes. It was about or two years old at the time. I sold an old motorcycle for enough money to buy a HardCard 40 MEGA-byte drive in it. I now carry around a 4-gig Corsair thumb drive in my pocket and have a Blackberry with more compute power.